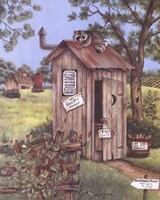 Kay Lamb Shannon’s “Outhouse Rooster” is a rustic country print of an outdoor “private” privy with a rooster on top of it. 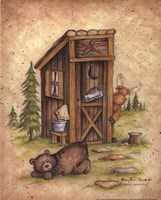 Surrounded by wilderness, the outhouse with a moon carved into the door stands at the end of a dirt trail and is surrounded by a wooden fence covered in wild raspberries. Off in the distance, a red barn with a classic windmill stands on the farm’s open field. 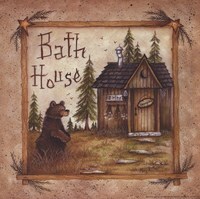 Great for a country cabin or rustic bathroom, “Outhouse Rooster” looks best framed in a natural or brown frame.